Analysis: The president likes to talk about Jews becoming Republicans, but the heart of his Israel agenda is keyed to a more critical, reliably conservative constituency. WASHINGTON — In a few weeks, the Rev. John Hagee will enter the heavily guarded gates of the Israeli Embassy here to address a "solidarity" gathering of Jews and Christians, according to an invitation obtained by NBC News. Hagee, one of the most influential and controversial evangelical Christian leaders in the United States and the head of Christians United for Israel, said in February that Israel was just days or weeks away from major armed conflict with its Muslim neighbors and that it would win the first in "a series of wars that end in the coming of Messiah." It wasn't long ago — 2008 — that GOP presidential nominee John McCain was forced to reject Hagee's endorsement because Hagee had delivered a sermon suggesting the Holocaust was part of God's plan for Jews to return to Israel as a catalyst for the Biblical end times. Times change and white evangelical Christians are proving a more reliable partner both for Republican President Donald Trump and for Israeli Prime Minister Benjamin Netanyahu than American Jews, who largely vote Democratic and who are deeply fractured over Israel's policies. His most visible moves on Israel policy — relocating the U.S. Embassy to Jerusalem, and recognizing Israel's claim to the contested Golan Heights region in the runup to Israeli elections last week — are crowd-pleasers with evangelical voters who believe that Jews must have full control of Jerusalem for the return of the Messiah and the beginning of the end times. That's the foundation for the strange-bedfellows relationship between pro-Israel American Jews and white evangelical Christians: Many Jews have accepted the support of Christians for Israel because they don't believe in the New Testament prophesy, and many Christian Zionists are happy to find common cause with Jews for now in order to help bring about Armageddon. But Netanyahu and Trump have simultaneously thrilled Christian Zionists and put stress on Jews by abandoning a "two-state solution" to the Israeli-Palestinian conflict that envisioned side-by-side nations and going all-in on Israeli expansion. "Moving the embassy to Jerusalem was not for Jews. That was not for us ... That was a statement for Christians," Danya Ruttenberg, a Chicago-area rabbi and author said in a telephone interview with NBC News. "The Christian Zionist interest in annexation [and] occupation is driven by an ideological interest in driving the end times into being." While critics of Israel and its policies — including Rep. Ilhan Omar, D-Minn., who has elicited condemnation from Trump and many Democrats for her commentary — tend to focus on the perceived power of the so-called 'Israel lobby' as represented by groups like AIPAC, Christian Zionists like Hagee and his followers exercise tremendous influence in Washington. "We’re not another paper-shuffling, hand-clapping group of Christians who get struck up on joy once a year and go home and forget it," Hagee said in a recent interview available on YouTube. "We are 4.5 million people who are organized in every state, every city, every voting district." "We put 35,000 emails in his office ... he yanked that bill down," Hagee said. "We are doing that over and over and over." 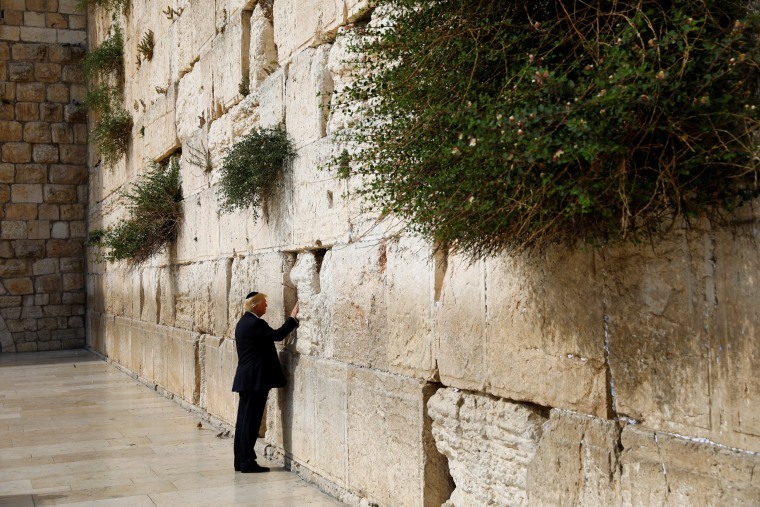 The hand of the Christian Zionists has become increasingly visible because of Trump's reliance on their community and his periodic candor, according to people who study the issue closely. "The end goal isn’t what’s good for the Jewish community, the end goal is what’s good for the second coming of Christ," said Robert P. Jones, CEO of the Public Religion Research Institute. "If you’re purely thinking from a tactical point of view, you’ve got a bigger group in white evangelicals, and you’ve got a group that as a whole has a theological orientation that thinks that this is an important thing for their theological worldview." Jones notes that in a survey of the American Jewish community taken before the 2012 presidential election, PRRI found that 45 percent said support for social equality was most important to their Jewish identity while only 20 percent named Israel, and that only 4 percent said Israel was their top consideration in deciding how to vote in that year's election, compared to 51 percent who said jobs or the economy and 15 percent who said the growing gap between the rich and the poor. He and his allies have focused on Omar, the freshman representative who has received broad condemnation for a series of remarks that were widely viewed as anti-Semitic. She apologized "unequivocally" for tweeting that U.S. support for Israel is "all about the Benjamins" — a suggestion that pro-Israel donors were using financial influence to drive American foreign policy — and later wondered why "it is OK for people to push for allegiance to a foreign country," which appeared to raise the trope of dual loyalty for Israel and America among U.S. Jews. His critics point to other remarks — the time Trump told Jewish Republicans they wouldn't support him because "I don't want your money," or when he said there were "fine people on both sides" of a Charlottesville, Virginia, rally at which white nationalists chanted "Jews will not replace us." He has repeatedly said that Democrats are "anti-Jewish" and "anti-Israel," he has proclaimed the arrival of a "Jexodus" — an odd portmanteau for a Jewish exodus from the Democratic Party given that the original Exodus pertained to Jews — and he seems to believe that American Jews who want Israel to remain both a Jewish state and a democracy will be drawn to his efforts to reduce immigration to the U.S. He went so far as to say "we're full" in a recent speech to the Republican Jewish Coalition in Las Vegas on the heels of a trip he'd made to the U.S. border with Mexico. While American Jews tend to vote on domestic issues, few matters are more divisive within their circles than Israel's borders. "Occupation has fractured the Jewish community in a lot of ways," Ruttenberg said. "We’re definitely not monolithic about it." But there's much more clarity when it comes to where Trump stands to benefit from pushing a hawkish line on Israel — and it's not with Jewish voters. "The political or tactical payout is much more likely to come from — if you’re thinking about votes — from the evangelical community than it is from the Jewish community," Jones said.